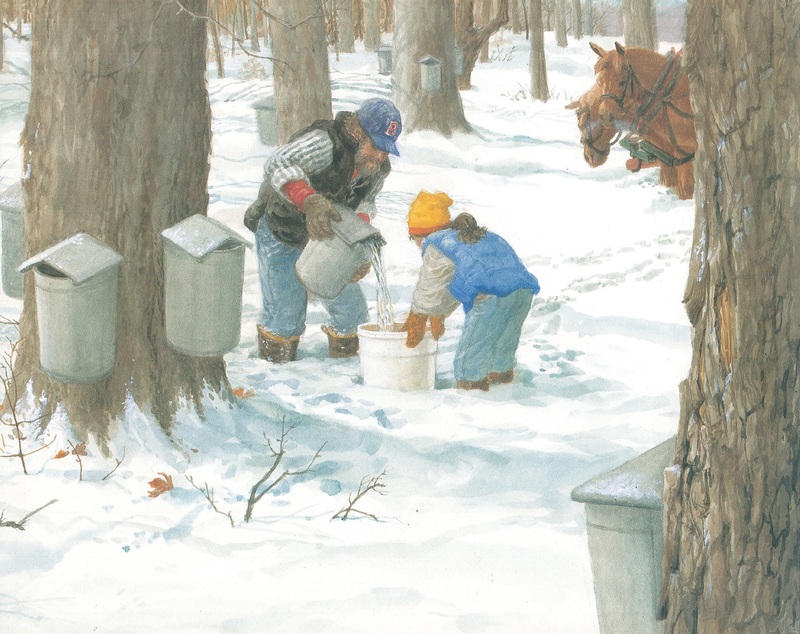 The publisher says… Nora and Gramp are collecting sap from maple trees to make maple syrup. The horses, Bonnie and Stella, are working hard, too, pulling the heavy sap tank through the snow from tree to tree. This third story about Nora and her grandparents brings the beauty of a Vermont farm in early spring vividly to life. Eva says… This is MY KIND OF BOOK for a LOT of reasons! Do you wanna know WHY? Because one, it’s got SNOW. Two, it’s about VERMONT. Three, it’s got lots of facts. And four, it’s also a STORY. So one plus two plus three plus four means it’s a GREAT one. This one explained so much to me. Like how they make syrup, and what those buckets are that are all hanging on the trees in the woods, and why they do it in spring, and how they make the syrup with a fire, and EVERYTHING. There was some dumb Curious George book about making maple syrup but it didn’t have anywhere NEAR the facts that this one does. But that’s the other part of this one, is that it’s also a STORY, about this girl Nora and her grandpa who makes syrup, and those two horses who help out and bite Nora when she tries to give them syrup. Because they thought SHE was candy! The internet says the woman who did this one is from VERMONT. I could have guessed that! And in the book, the girl’s grandpa has a RED SOX cap. I’d have a Baltimores one but I’m unique. We really need to buy this one and then Mikey can read it too and learn about syrup!